In the world of marijuana-infused foods, there are edibles... and then there are these weed butter-stuffed chicken tenders, which kinda take the whole concept beyond the realm of being fit for consumption and into begging for consumption. They were whipped up by Chef MasterBeater, a friend of a friend of The Vulgar Chef, and are kinda like chicken Kiev. Or is it chicken kief? 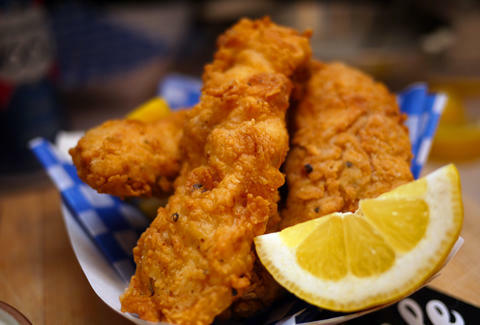 The sublime chicken strips were made by injecting scallion-infused weed butter into sliced chicken using a "poultry flavor injector" (because frying them in weed oil would apparently burn off the THC), brining them in buttermilk and garlic, dredging them, and deep-frying them. What results from all this is some seriously amazing chicken, which they serve with a homemade ranch sauce. You can get the play-by-play recipe right here, and make sure you don't have any plans 30 minutes after you eat this stuff. Both for the food coma, and for... y'know. Adam Lapetina is a Food/Drink staff writer for Thrillist, and highly encourages anyone in Colorado, Oregon, or Washington to try these out. Read his musings at @adamlapetina.